Who has had a tremendous impact on your career and how did this person help you? I attended Tougaloo College for my undergraduate degree. Tougaloo has a history of preparing students to work in law, on public policy, and with civil rights. Dr. Ernst Borinski taught constitutional law at Tougaloo and I became his teaching assistant after graduating a semester early. He encouraged me and others to go to law school and to be of service so we could come back to help people in need here in Mississippi. He was concerned about the lack of freedom we had in this country and he felt the law was an avenue to protect that. Under his supervision, I applied to law school and attended The George Washington University Law School. After graduating from law school I came back and taught with him. Mainly, it was the people, place and environment at Tougaloo College. What unexpected turns has your career taken? Becoming a judge. I was not expecting to become a judge one or to be one for as long as I have. It’s been 29 years now. 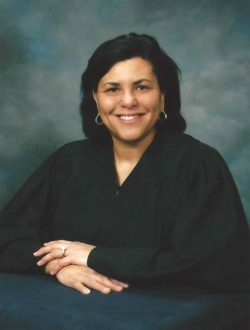 When I graduated from law school, there were very few African-American judges and only one female judge serving at that time. The opportunity came and I took it. What is one characteristic that you believe is important to be successful and why? What are you doing to ensure you continue to grow and develop in your career? Every day I’m striving to develop my legal skills. Even as a judge, I have to continue with my education because the law is so vast. I try to join organizations that are relevant to my work, to women, and judges. The American Bar Association (ABA) has so many educational programs that I use and all of those organizations allow me to not only keep my skills but to also develop them. It also helps me learn about changes in the law so I may be prepared, specifically changes that affect the judiciary. Why is supporting the mission of the Bessie Young Council important to you? We need non-traditional students. We need diversity and the knowledge that they offer. I am on the diversity committee of the ABA section and we offer internships for a diversity scholarship. This program provides a step for those who may be at a disadvantage. Just giving something – anything – to a student could be the beacon that indicates they should go on. I’m glad to now know about the Bessie Young Council and definitely want to participate. These programs are what we need so I’m excited! What are your strongest memories from law school? My favorite place to study was the Library of Congress. I was always in awe of all of the books and it’s a beautiful building. Just knowing that it was a repository of knowledge and books, I liked going there. Washington was a wonderful place to go to law school and George Washington University was just a few blocks from the White House. Just being in D.C. and in the political environment is a wonderful memory. I was there during the Ford and Carter years and watching the whole place shifting presidencies was wonderful. For that reason you could also find something to do—whether it was working on Capitol Hill or working in the law school clinics.